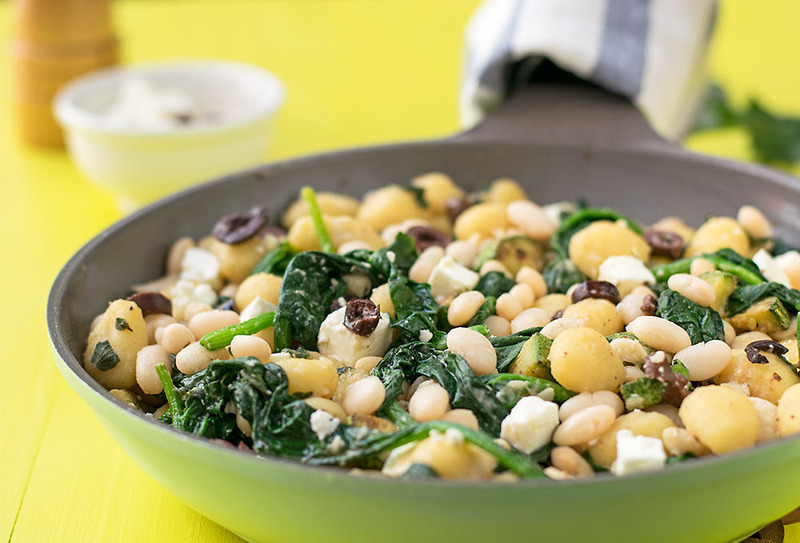 These gnocchi are very easy to make and a great choice for a healthy and quick family dinner. 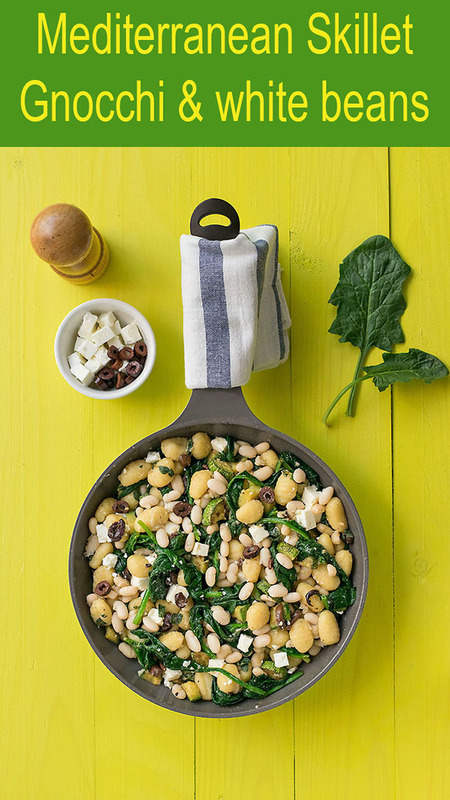 Now about that bean paradox I was talking about… Greek people love white beans, and they’ve learned how to cook them in their dried form, from their mothers and grandmothers (I know I have!). You see, white beans were more common some years ago, and in their dried form were easier to store, required less space, and were cheaper since you didn’t have to pay for canning and other costs. So, seeing my mother cooking with dried beans only, and never opening a can has made me skeptical and hesitant every time I pass in front of the canned food aisle in the supermarket. That’s why dried white beans rule the food aisles of the supermarkets, because everyone here prefers them over the canned ones! Everyone knows that when you want to cook dried beans you must always plan ahead and soak them in water from the previous day (unless you have a pressure cooker) and let them become hydrated and pretty. A little trick I learned recently is to add some salt to the water when soaking them. Know that I think of it, it’s the same thing as brining a piece of meat to make it extra juicy and succulent. By brining things, what you do is allow the salt molecules to penetrate your food. This not only adds flavor, but since salt binds water, helps your food to retain some extra moisture during cooking, thus preventing it (up to a certain level) to become dry. Try these brined extra crispy and juicy chicken bites and see for yourself! The same goes with beans. When you brine them, you allow extra moisture to penetrate them, making them softer and more easily cooked. Be careful though not to add any salt to the water during cooking, not until the end, since this will make them tough. 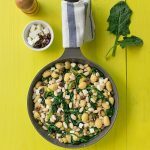 Another great recipe with beans is this traditional white bean risotto, a very popular and hearty Cretan dish. If you use dried beans, soak them in salted water for 12-24 hours before cooking, since this will hydrate them and make them more tender. While cooking beans don’t add any salt until they’ve softened. Choose gluten-free gnocchi if you don’t eat gluten. What beans to use? Canned beans may contain preservatives and other additives, extra salt, and can be pricier. On the other hand, they’re always soft and tender, and a lot easier to use. In the end, the choice is yours! If you choose to use dried beans, cook some extra and have them ready to use in salads and other dishes throughout the week. 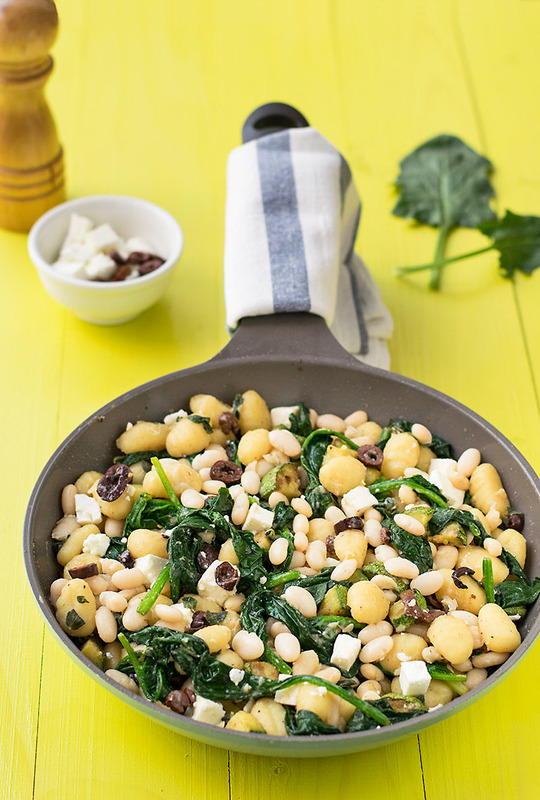 These gnocchi with white beans and spinach are very easy to make and a great choice for a healthy and quick family dinner. In a large skillet heat the olive oil, onion, garlic and zucchini over medium/high heat and cook for 3-4 minutes or until onion is soft and translucent. 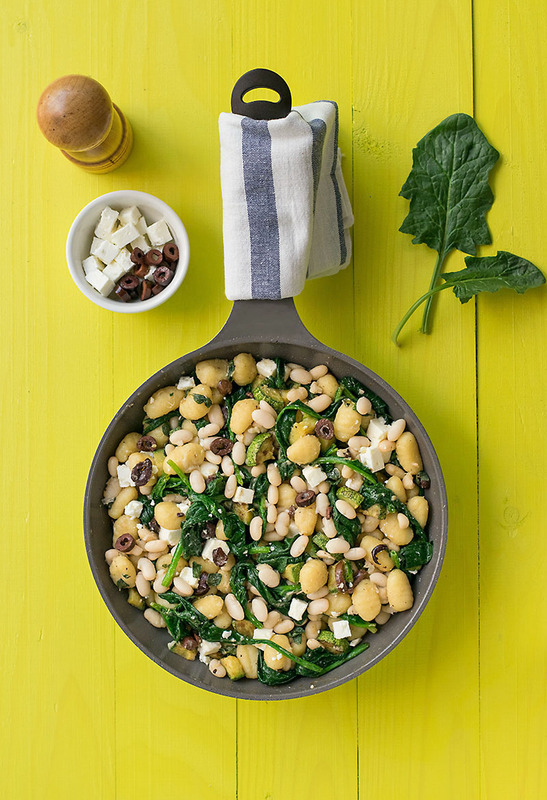 Add the gnocchi, the white beans, and the lemon juice and stir gently to combine. Taste and adjust lemon, salt, and pepper. Remove from heat and add the crumbled feta cheese. Eat! 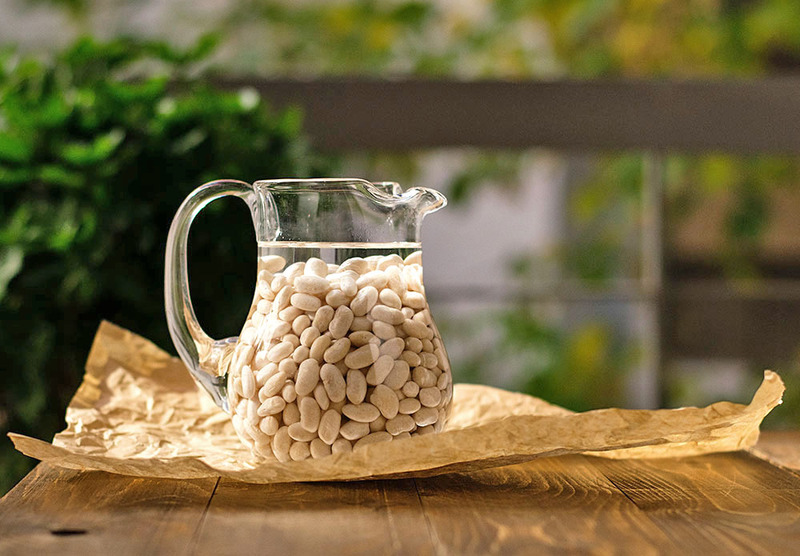 If you use dried beans: soak 1 cup beans in 4 cups water with 1 tablespoon fine sea salt for 24 hours. Drain and rinse well, then transfer to a pot, cover with water – don’t add any salt – and boil until tender (about 50-70 minutes depending on the hardness of the water and the age of the beans). Use the quantity needed for this recipe and store the rest in the fridge for use in salads and other recipes. We also use dried beans only, not the canned ones. 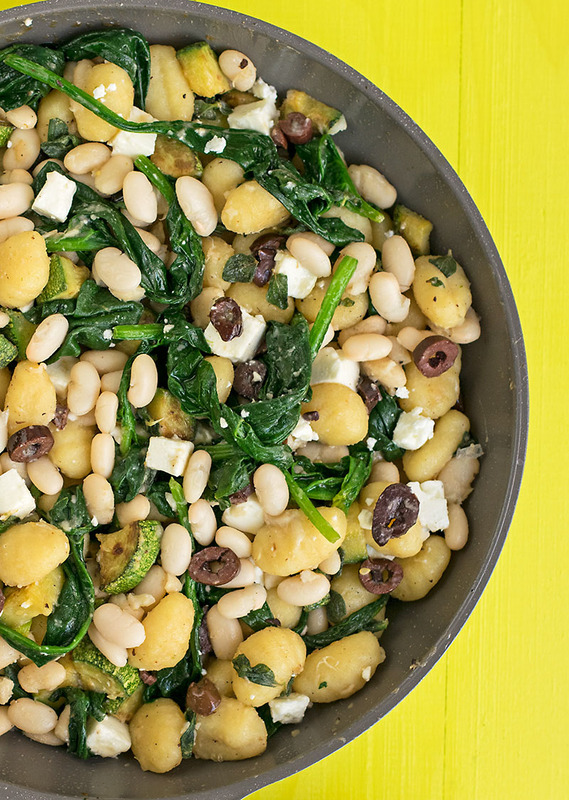 This recipe looks super healthy and delicious! Nice to hear that Akhila!